Noises in the joints (popping, cracking or clicking) can be quite disturbing and cause concern. Often, these noises are not indicative of any underlying problem. Such noise often persists for years without any real problem developing. If there is no pain with these noises, you can assume it is being caused by the soft tissue in a joint and is normal. But, noises associated with pain may indicate damage to the surfaces of the joint. 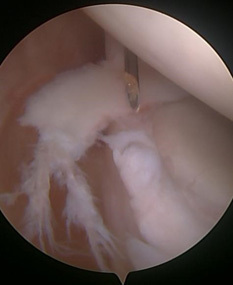 Such cracks and clicks may be due to tears in the labrum, which may snap over the other structures as the arm moves. If the labral tear is at the top of the shoulder, it is called a “SLAP lesion”. An MR Arthrogram is often useful to show a labral tear, and is about 80 to 90 per cent accurate. A good clinical examination by an experienced clinician is the best way to make the diagnosis, with scans to assist when required.